GenderAvenger’s mission is to create a community that ensures women are represented in the public dialog. We’re not sure there could be a more perfect example of that than Candace Jean Andersen’s quest to identify one lone woman among 37 men and ensure her voice and her contributions are recognized. It was a quiet Friday morning, one of those days where the baby was finally napping and the to-do list wasn’t too nagging. I felt inspired to work on the nonfiction picture book about orcas I’m writing, but I kept getting distracted by a pretty, half-hidden face in one of the photos I was working with. She was in a black and white photograph in an article about the Marine Mammal Protection Act and captioned “not identified”. 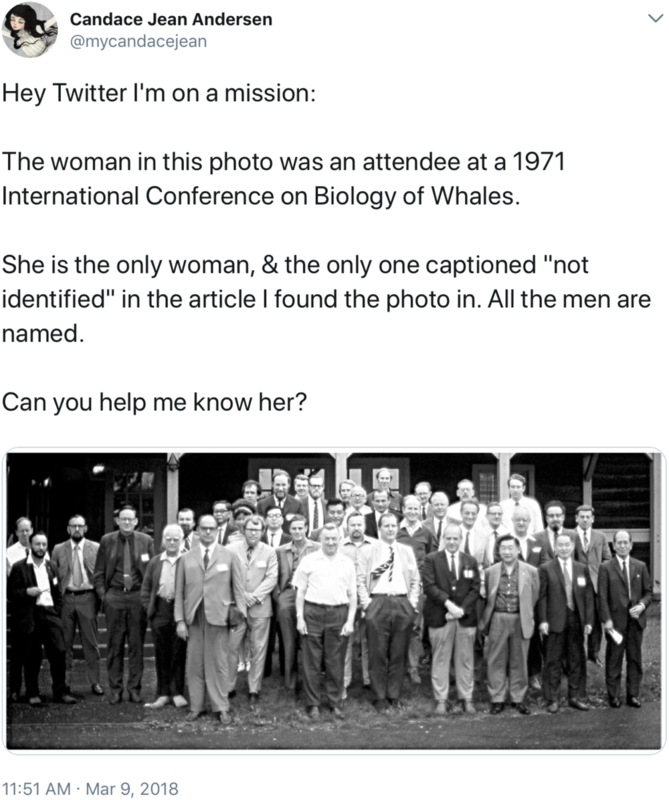 The 38 people in that photograph had gathered at the 1971 International Conference on the Biology of Whales to discuss the role of whales as part of a healthy ecosystem. Standing among them was a lone black woman with an armful of papers. Nearly all of the 37 men were identified by name, but not her, and that wasn’t good enough for me. She had been at the conference for a reason. She had done a job, stated a fact, maybe written down something important. She meant something. It was a long shot, but I shared the picture on Twitter to see if anyone knew who she was. I had a meager following, so I imagined the tweet being snuffed out by the endless expanse of incoming GIFs, bad news, and political complaints. But later that evening, my phone notifications were going berserk from people liking, sharing, and commenting on my post. Black women in particular were sharing the post with their followers, asking for help in identifying the woman in the photo. Soon after, people started naming names. My tweet had gotten in front of someone that knew an attendee of the conference. It was seen by people with access to archives and people that shared links to conference proceedings and various articles. By the next day, the post had gone viral. I searched as many of the suggested names as I could, but the post was getting away from me. I couldn’t keep up. The Twitter app on my phone kept crashing due to activity. Late Saturday morning, a clue came in suggesting the woman worked in administration for the Smithsonian, so I tagged them in a follow-up post asking if they might be able to help. By that afternoon, we had confirmation on a name that came up frequently when searching the title of the conference: Suzanne. The woman named Suzanne had helped coordinate the event but unfortunately was not the woman in the photo. She did offer to look at the picture to see if she remembered anything, and by that evening I had a new name: Sheila. I searched and searched the name but could not confirm her identity. 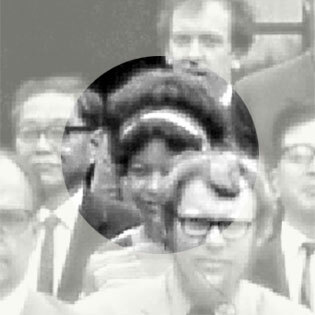 Bob was an attendee of the conference and told us that the woman in the photograph had worked for a man named Clyde Jones, who also attended the conference. Sadly, Jones passed away a year or so ago, so there was no way to confirm. It felt like I’d hit a dead end. After all of this, did I just assume her name was Sheila and leave it at that? I didn’t feel right about it. It still didn’t feel good enough. Right then, an email came in from Deborah who worked in Archives at the Smithsonian. She’d found conference proceedings, but there was no mention of Sheila, just Clyde. She’d found hotel receipts for where the conference was held — and this time there was a receipt for Sheila. I had been sharing my findings on Twitter as they came in, and after sharing the information from the Smithsonian, two women helping in the search commented almost simultaneously with a possible current last name for Sheila. I awoke the next morning to her reply. My eyes stung and a strange, triumphant warmth welled up inside me. We found her! A few days after confirming her identity and sharing the news with Twitter, Sheila and I had a nearly hour-long phone call. She talked to me as if I were an old friend, sharing memories and laughing about life stories. Sheila is humble, kind-hearted, and patient. She is sweet and she is whip-smart. At the time the photograph was taken, Sheila had a B.S. in Biology and was working her first position in the Federal government when her boss, Clyde, requested that she go to the conference. She later went on to pursue environmental science and received her M.S. from George Mason University. She worked for several federal agencies and retired a GS-14 after 35 years of service. She reminded me to always take the high road and to never, ever let go of my passions. She ended our call by thanking me for “seeing her” in that old photo. Candace Jean Andersen is a writer and artist currently living in the suburbs outside of Salt Lake City with her two sons, boyfriend, and menagerie of animal companions.